Corpus Christi Academy was born in 2016 when families from two beloved Catholic grade schools joined forces to keep Catholic education alive and thriving in our area. Saint Clare School in Lyndhurst and Sacred Heart of Jesus Academy (formerly Saint Gregory the Great) in South Euclid officially merged to create a new school called Corpus Christi Academy. Opened in August 2016, the merger brought together two schools with a combined 160-year legacy — both with excellent reputations for academics, family bonds, community traditions and a vibrant Catholic identity. Corpus Christi Academy students have reaped the rewards of the merger, with access to many shared resources. New academic and extracurricular programs were implemented, including an art program, more extensive drama and music offerings, more clubs and a stronger and larger athletic program. Technology and library resources from both schools were combined, giving greater opportunities to students. Parents from both schools helped to launch the new Corpus Christi Academy, worked with the merger steering committee which included Saint Clare pastor Fr. Stanley Klasinski and Sacred Heart of Jesus pastor Fr. Dave Ireland. Both pastors were pleased to see Corpus Christi bring together the best of both schools and assure a Catholic elementary school presence in our community. 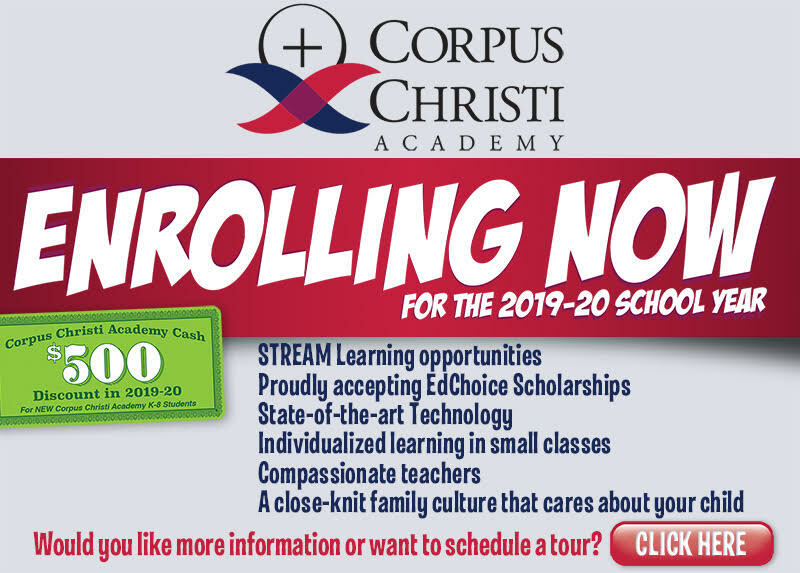 Corpus Christi Academy (CCA) is located on the Saint Clare campus at 5659 Mayfield Road and offers Preschool and K-8 classes. The enrollment for the 2018-19 school year in grades Pre-K through 8 is 167 students.